On the east side of Yellowstone, the Beartooth Highway is the one road you simply must drive. 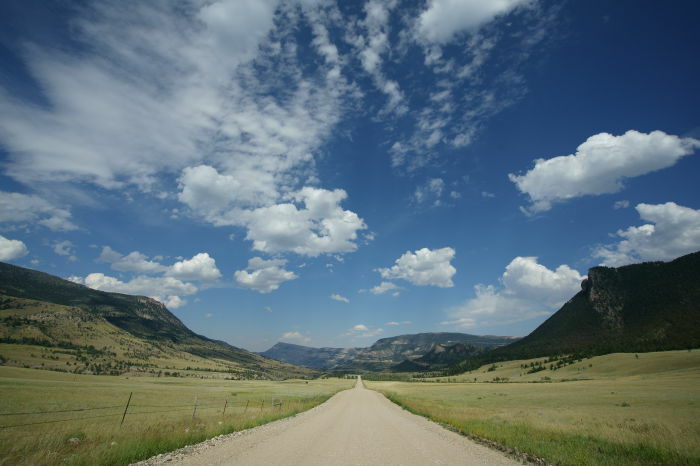 But if you can find some way to squeeze in another jaw-dropping scenic byway, Chief Joseph Scenic Byway is there for you. 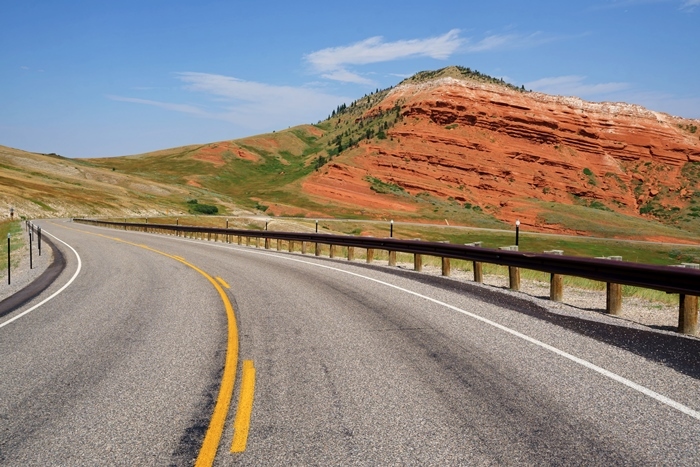 This scenic highway provides a connection between Cody, Wyoming, and Yellowstone’s northeast entrance. Along the way, it takes you through the stunning Sunlight Basin and over Dead Indian Pass, with dozens of curves in between the two. I’d even suggest driving this road, then turning around and driving back to where you started. That’s what I did. 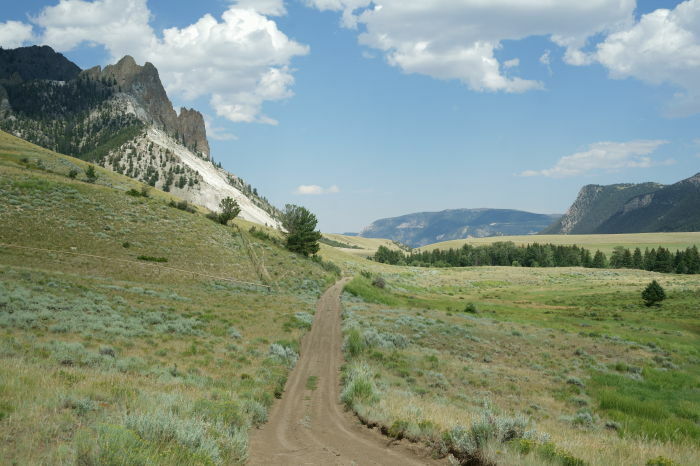 Chief Joseph Scenic Byway is also known as Wyoming Route 296. It begins at the Beartooth Highway, US 212, southeast of Cooke City, Montana, and ends at Wyoming 120, 17 miles north of Cody, Wyoming. I didn’t need to drive down the Chief Joseph Scenic Byway. I had started my day at the Top of the World Motel and Store, along the Beartooth Highway, and I was ending my day in Silver Gate, which is also along the Beartooth. I had only one reason to detour onto Chief Joseph. I wanted to see more spectacular scenery, and I knew there was no way this road would disappoint. But, it did. At least at first. 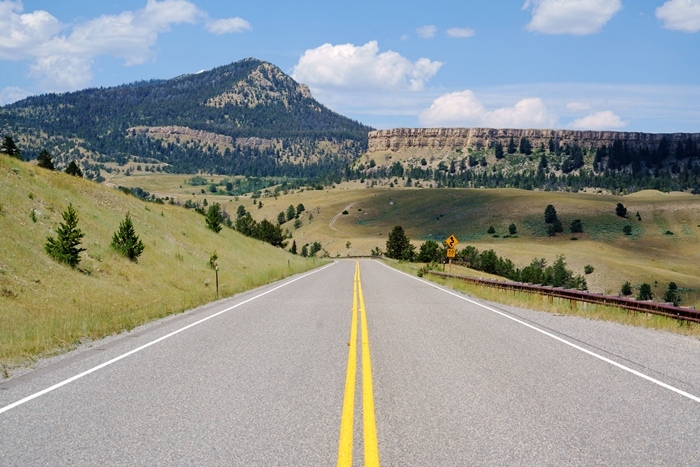 Headed south from US 212, the Chief Joseph Scenic Byway is nice, but it’s a big step down from the photo-around-every-curve experience of the Beartooth. 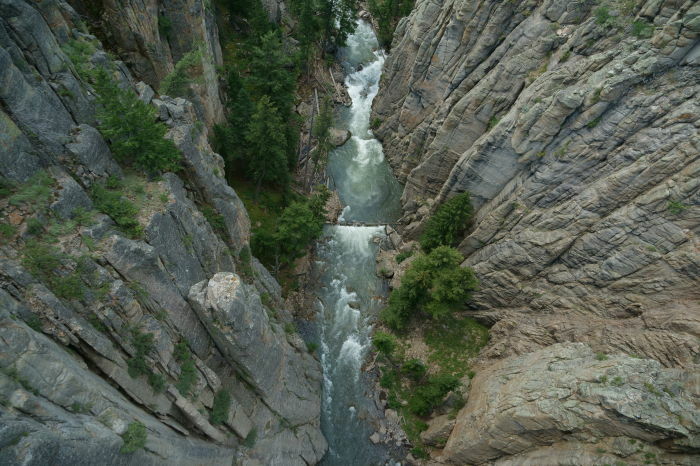 It didn’t help that this area is more developed than the Beartooth, and there are numerous vacation rentals and homes, and a few businesses on this stretch of the road. There’s also a lot of private property, and fences. After a few miles of this, I turned off at a “scenic view” turnout. There wasn’t much of a scenic view, and the only thing that was interesting about this spot was the pond, which was behind a fence. I started to question whether the Chief Joseph Byway was worth my time. But I decided to continue on, and I’m glad I did. While those first few miles on the northern end of the byway were discouraging, the scenery picked up and the development tapered off after a while. The road travels downhill from the Beartooth, at one point traveling around the base of Sugarloaf Mountain. 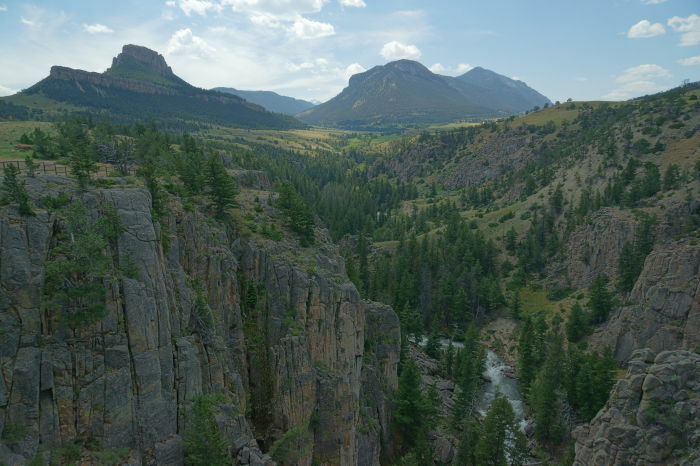 Other mountains and cliffs loom in the distance, on the opposite side of Clarks Fork Yellowstone River, which is hidden in the valley below. The highway bottoms out at Sunlight Gorge before its big climb up to Dead Indian Pass. There’s a scenic turnout here that actually delivers on the scenery. Sunlight Creek has sliced its way to the bottom of a deep, steep-walled gorge. From the parking area, you can easily walk across the Highway 296 bridge. Looking straight down makes your head spin. This is the highest bridge in Wyoming, about 285 feet above the water below (give or take a foot). Just beyond the bridge, you’ll find the turnoff to Sunlight Road. More on that worthwhile detour in a moment. The Sunlight Gorge Bridge is around 6,100 feet above sea level, while Dead Indian Pass is at 8,071. That means, we’ve got some climbing to do. … until you reach the official scenic turnout at Dead Indian Pass. 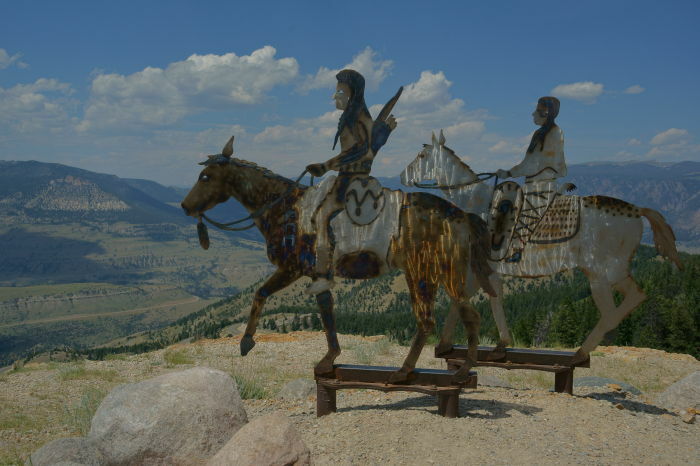 There are some neat metal sculptures here, honoring the Native Americans that gave the pass (and nearby mountain) its name. The exact origin is unclear, though. It might refer to a Nez Perce Indian killed here around 1877, or a Bannock Indian killed in the area the following year. I had already spent a good chunk of my day driving a road that I didn’t need to drive. I had reached the high point, and presumably the most scenic spot on that road. So why go any further? I don’t know that I have a good answer to that question, other than that I had come this far, so I might as well finish it. So, I continued on, down the hill from the pass to Route 120. It was probably a mistake, because I got caught in road construction, and then had to get caught in it again on the return trip. But, those final few miles of the road were also quite scenic — although the landscape had changed dramatically from the scenery around Sunlight Gorge. Over here on this side, the hills were smaller and much redder. There were a few dramatic curves that took me sweeping around those hills, and then the road ended unceremoniously at Route 120 — an intersection that didn’t even offer a convenience store, or any other signs of civilization. I made a U-turn and headed back the way I came. I realize there’s a laundry list of locations that could be considered the most beautiful place in Wyoming. Purely by accident, I discovered a strong contender for the title. Sunlight Road branches off the Chief Joseph Scenic Byway near the gorge, and heads west into the mountains. This dirt road takes you through a wide, mostly undeveloped valley that overwhelms with the subtlety of its simple, unspoiled western beauty. This stretch of Sunlight Road runs for several miles. Stunning mountains rise on either side, spaced apart by flat ranchland. I had to get out of my car several times, and simply stare at it. I’m not sure I can express why I found it to be so beautiful — perhaps it was because I turned down Sunlight Road on a whim, with no idea of what I would find. I had never read about it. I had no expectations. 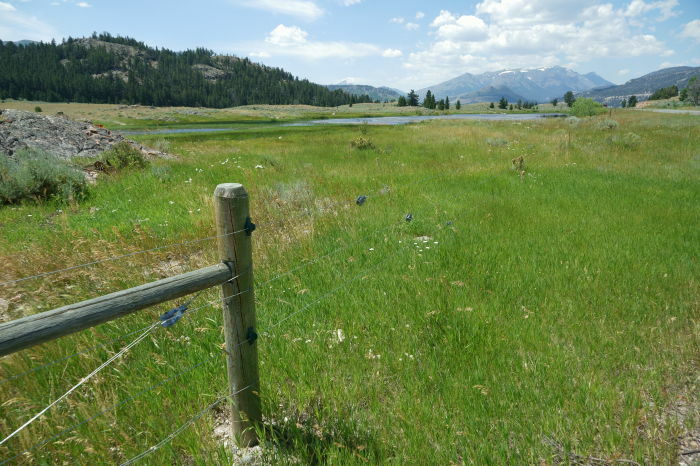 While much of the property is vacant, and some is for sale, there are developed ranches out here as well. 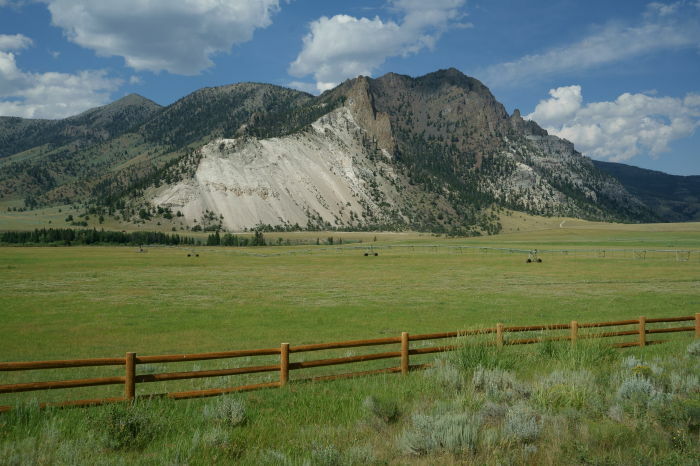 A simple wooden fence around one of those ranches added to the beauty. Beyond it, White Mountain stood guard over the valley. The wide, straight road started to get more narrow and complicated after a few miles. A side road led past a rest area (pit toilets), then a bridge took me across Sunlight Creek to the other side of the basin. The roads were steadily getting narrower and rougher, until I was on a road only suitable for a Jeep, near the base of White Mountain. I decided I had pushed my luck far enough. I backed up to a suitable turnaround point and backtracked to Chief Joseph Scenic Byway. Had I continued on Sunlight Road, I would have eventually passed a Forest Service cabin that’s available to rent for $150 a night during the summer months. Then there’s another campground, followed by numerous spots identified as “gulches”. But now I’m just telling you what I can see on a map. I really should have continued out Sunlight Road and explored further, because once I returned to the Beartooth Highway, the weather had taken a turn for the worse. I had rushed through the most beautiful part of my day, only to finish the day in clouds and drizzle. But at that point, I had no other choice. I drove on to Cooke City and Silver Gate and settled into my accommodation for the night — a most unsatisfying lodge with dirty shared bathrooms and tiny wooden jail cells called rooms. 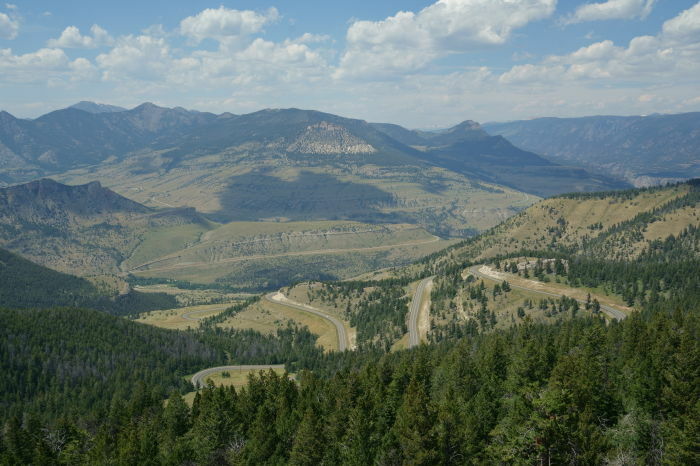 A drive down Chief Joseph Scenic Byway is a good addition to a road trip on the Beartooth Highway. You’ll definitely want to stop at Sunlight Gorge and Dead Indian Summit to enjoy the views. I’d also suggest turning down Sunlight Road, just to see if you’re as impressed with this area as I was. If you are, please let me know.